This is a to make ahead easy supper, the only requirement is that you do your preparation, the day before. Plan your dinner one day in adavance and you will have a great success with your family!! Simple ingredients for a summer delicious meal made in an instant (15 minutes), and healthy too ( under 420 calories per serving). 2 good pinches of salt, ground pepper to taste. 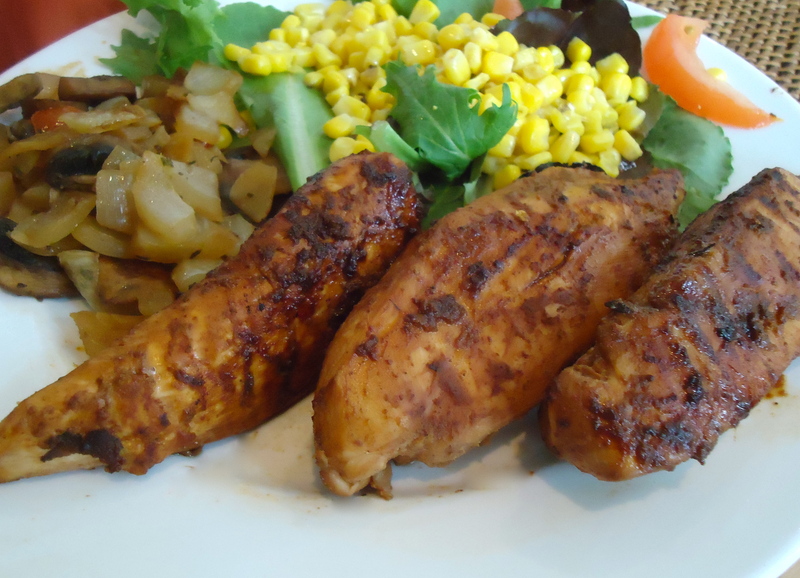 Place chicken breasts, barbecue sauce and lemon juice in zip-top bag, shake bag to coat chicken, seal and refrigerate for 12 hours at least to overnight. In small sauce pan, heat chicken broth, keep it warm and covered. Film with oil or cooking spray a medium skillet . Saute’ onions and mushrooms first, over medium heat till soft, adding 2 to 3 tablespoons of chicken broth or warm water to avoid veggie mixture to dry, saute’ until mixture is soft about 4 minutes, add herbs, salt and pepper. Keep warm and covered while your are grilling chicken breasts. Heat your grill pan to medium high and coat with oil or cooking spray. Grill chicken on both sides about 6 minutes (depending of thickness) , making sure your chicken is cooked thru ( should register 160 degrees), keeping the marinade.When chicken is grilled , remove on plate, add marinade from the bag, 4 tablespoons of chicken broth, let it reduce for 2 to 3 minutes at low temperature, then bring back chicken breasts to the grill pan and cook for 3 to 4 minutes, till coated turning once. If using a charcoal grill, when your chicken breasts are grilled, add them to a lightly coated skillet, then add the marinade and broth, simmer at low heat for 3 to 4 minutes turning once. In a small bowl, add salad dressing ingredients, starting with Dijon mustard, vinegar, then gradually olive oil, whisk well to emulsify the vinaigrette, add salt and pepper. In a large bowl add 1/2 of salad dressing, salad greens, corn kernels, tomatoes and zucchini, gently mix, then sprinkle remaining dressing an toss lightly till all well coated. Add to each plate salad a portion of veggie medley , a chicken breast and its sauce, serve immediately.